The Make it Green in 2015 campaign was started to help us all find easy ways to make changes in our lifestyles to improve our environment. It starts with a connection, just thinking about what you are using and how that impacts Earth is the first step in going green. Paper towels and other paper products are handy, there’s no denying that. We’ve always had a roll of paper towels around to wipe away the kids messes after meals, as well as assisting with getting the kitchen and bathroom clean. Paper towels produce more garbage but luckily, Bambooee offers an excellent green alternative to paper towels. They are reusable, each towel can be washed up to 100 times! Just one roll of Bambooee Unpaper Towels replaces 286 paper towels. This can save you a substantial amount of money, and is very environmentally friendly. Check out the full review of Bambooee- The Unpaper Towel by Latched On Mom. This is one way that every person can help with being green and for 2015 its time for us to start that movement right.. The kitchen is one of the places where if we really took some effort you can get all you need and still be green. Energy Efficient appliances and using products like these are great places to start! 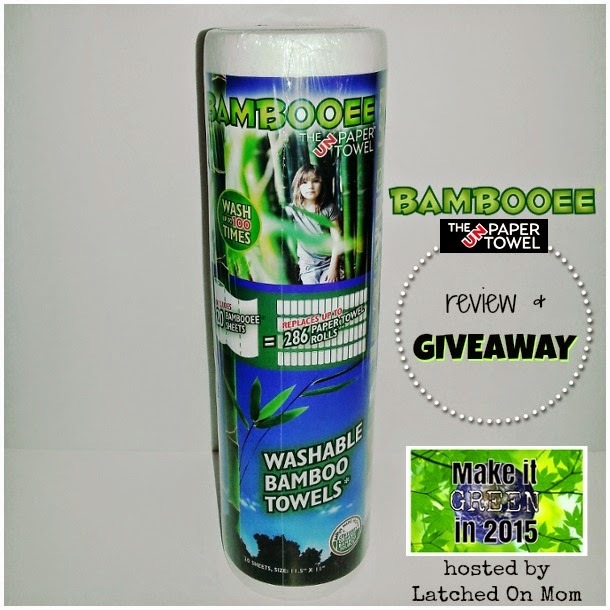 Bambooee is giving away a roll of the towels and a roll of the sweeps! If you’d like to enter to win, just fill out the competition form below! The giveaway will run from 2/19/15-3/8/15. Open to US only. Void where prohibited. Must be 18 years of age or older to enter. Winner will be announced on this post, as well as emailed (so make sure to log into the competition form using the email address you use). You will have 48 hours to respond or a new winner will be drawn. Latched On Mom was given a free product to test for review purposes, but did not receive payment for the review which was given. All opinions are my own, written by me. Other participating bloggers did not receive compensation to promote this giveaway. This giveaway is in no way sponsored, endorsed or associated with Facebook, Twitter, Pinterest or any other social media. Prize fulfillment is the sponsor’s responsibilty. these look fabulous! thanks so much for the great giveaway!